Recommended Name: � the Parisian Spanish pattern. This pattern was originally classified as S-1.13. 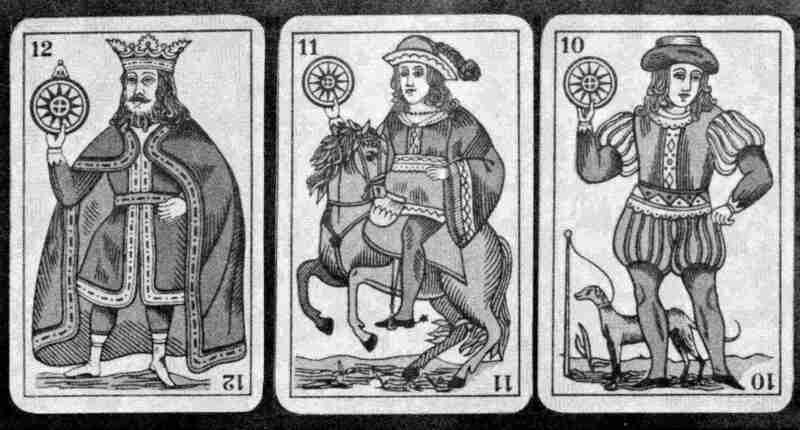 This type can be traced back to the beginning of the 19th century when the Real Fabrica de Madrid issued a variant of the National pattern (S-1.1) for use in France. Its most striking feature was the introduction of female cavaliers. The design was adopted in this form by several French manufacturers, though later versions reverted to the use of male cavaliers. The design has proved popular in several South American countries, and at least one South American made version carries the legend "Estilo Paris". In early examples the female cavaliers are noteworthy. The design is used widely in South America, where local variations occur. 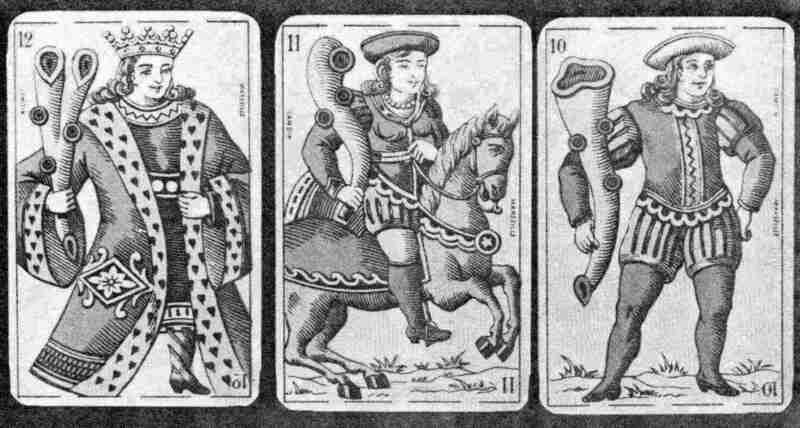 Among the more consistent features is the presence of a tethered hound in the background of the jack of coins. The kings' robes are usually parted, revealing their stockinged legs below short tunics. 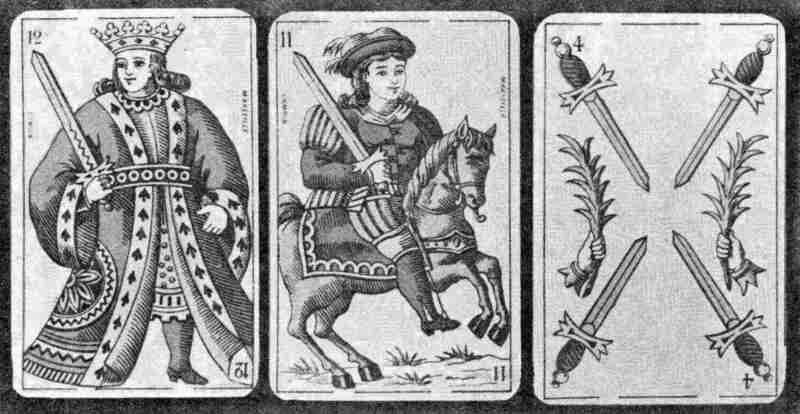 A hand may reach inwards from the frame-line to grasp the club on the ace of batons, while similar hands holding palm branches appear on each side of the 4 of swords. Small arrows sometimes appear on the ace, 2 and 3 of batons. Real Fabrica de Madrid, 1801-1820. A. Camoin, Marseille, 19th century. B.P. Grimaud, Paris, late 19th century. 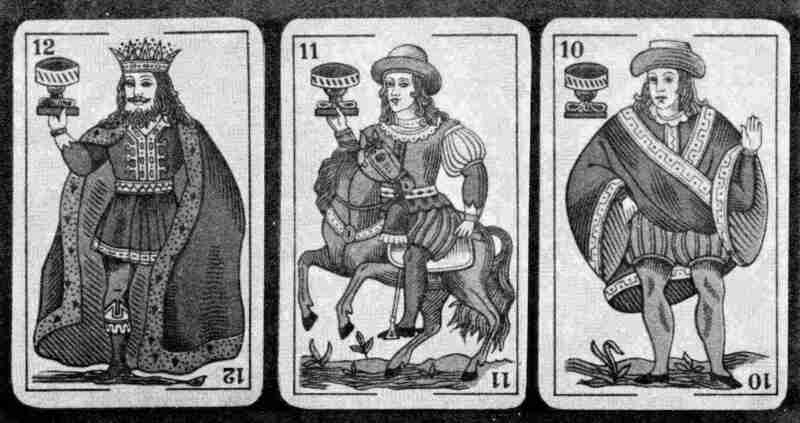 Casabo, Uruguay, and makers in Ecuador, Colombia etc., 20th century. lower two rows: M.C. de Casabo, Montevideo, c.1945.